Tuesdays mean just one thing here at spalanz.com – it’s Game Day, where the spotlight of awesome is turned onto one of the many, many games I own and enjoy. 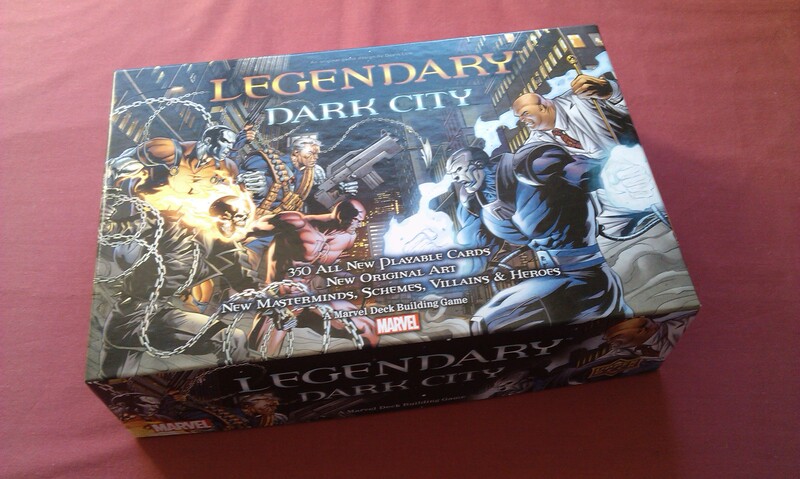 Today, it turns to the first big box expansion to Marvel Legendary – it’s time to enter the Dark City! 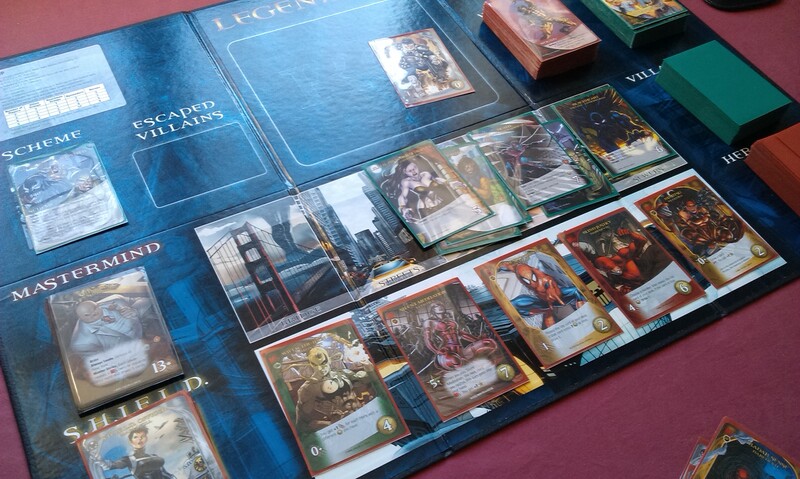 I love Marvel Legendary. I own and enjoy a lot of deck-building games, as you wonderful long-time readers will no doubt be aware, but there’s just something about this game that makes it feel so much more than just your usual deck-building experience. Maybe it’s the theme, or the fact there is actual gameplay involved as well as just round after round of buying cards, but there’s just something about it that really speaks to my soul. That said, when the core game came out back in 2012, it got old fairly quickly – and I didn’t even play it all that much at the time. However, Dark City arrived in the summer of 2013, and all of that changed. Indeed, since Dark City’s arrival, this game has never felt old to me since. Dark City wasn’t the first expansion to the game, but it brought something entirely fresh to the experience, with a slew of new cards that aren’t just exciting because they feature some of our best-loved Marvel super heroes, but also because of the level of thematic invention that come from them. Let’s take a look! In Dark City, we get three new groups of heroes: more X-Men; X-Force, and Marvel Knights. We already had X-Men in the core game, of course, but here we have some of the huge names such as Professor X, Jean Grey, and Angel. We also have Colossus, a new Wolverine, and Cable in X-Force, and some of my all-time favourite Marvel heroes in the Marvel Knights faction: Daredevil and Elektra! While the core set heroes were undoubtedly cool, the heroes of Dark City are so much cooler, I almost feel the core set needs to be redesigned to fit into this new world. I’m not talking about the artwork here – Dark City features different artwork for each colour of the hero-set, rather than each hero-set only having one piece of art across all 14 cards. I was actually fine with that, as it made the game almost easier to keep track of, and especially easier to clean-up afterwards. But whereas in the core set, there were some synergies such as Iron Man getting bonuses for playing tech heroes, the heroes of Dark City have thematic keywords that actually feel like they evoke that hero’s super power. Nightcrawler is always a favourite of mine for this, with his Teleport ability. It basically allows you to set aside a card with Teleport on your turn, then when you draw your six new cards on your next turn, you can add these cards to your hand, hopefully creating powerful combos. Another cool mechanic is Versatile, which allows you to use a hero’s combat or recruit value, depending on the situation. A couple of heroes have the ability, but the Domino hero is built entirely around this. I must admit, I was never really a fan at first – when I got the game, I was either absorbed by Marvel Knights, or focused on the X-Men. It was the very excellent manofyesterday who pointed out just how awesome this hero is, and I must say, I haven’t looked back since! Apocalypse and Stryfe are lots of fun to go up against, but my favourite has got to be the Kingpin. Well, being such a Daredevil fan, it’s somewhat to be expected… There’s a really cool mechanic that is shared between the Kingpin and his villains, the Streets of New York, called Bribe. This mechanic allows you to defeat the enemies with recruit points as well as attack, almost like some kind of link to Versatile. Anyhow, it sounds like it might make the game easier, but it’s just so very thematic that I can’t help but like it! Plus, the villain group includes such badasses as Jigsaw and Bullseye. Always fun! There are a lot of fun schemes to play here, including some fairly complex things that involve heroes in the villain deck, bystanders in the hero deck – which are complex for me, because I sleeve the cards based on what they are! For a long while, I just used to avoid these things, but they’re actually really fun. Among my favourite schemes to play, however, are Detonate the Helicarrier, and Capture Baby Hope. The former I find really exciting and thematic, as the scheme twists cause the hero slots to blow up – you start with more heroes than normal, as well as eight slots for the heroes, but while that sounds a lot, I can tell you, it doesn’t take long for you to end up with just one or two spaces left. 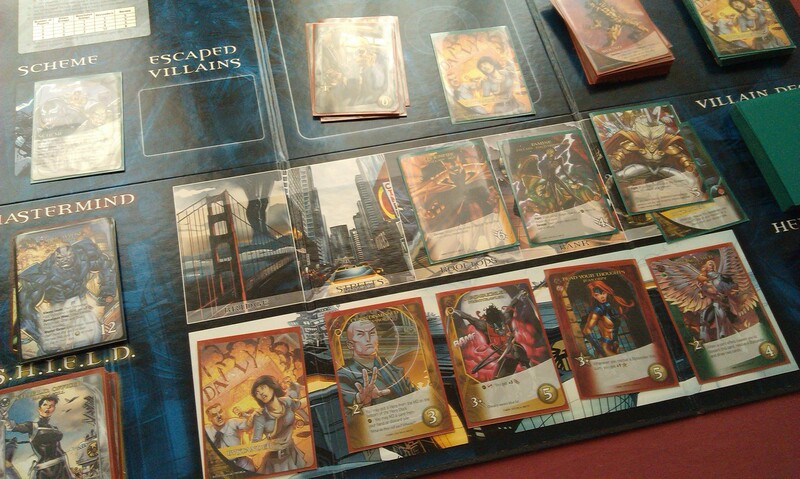 Capture Baby Hope involves the villains trying to capture Hope Summers, represented by “a token”. Anyway, it can be one of these really fun schemes where the token is bouncing around between villains and the heroes. This expansion is terrific. As of the time of this writing, I have picked up Secret Wars v1 just days ago, but I will still confidently say that this is the best expansion Legendary has seen thus far. It has some of my favourite Marvel characters of all time, which of course makes me biased from the off, but in games like this, it’s more than half the battle! If you only buy one expansion for Marvel Legendary, be sure to make it this one! 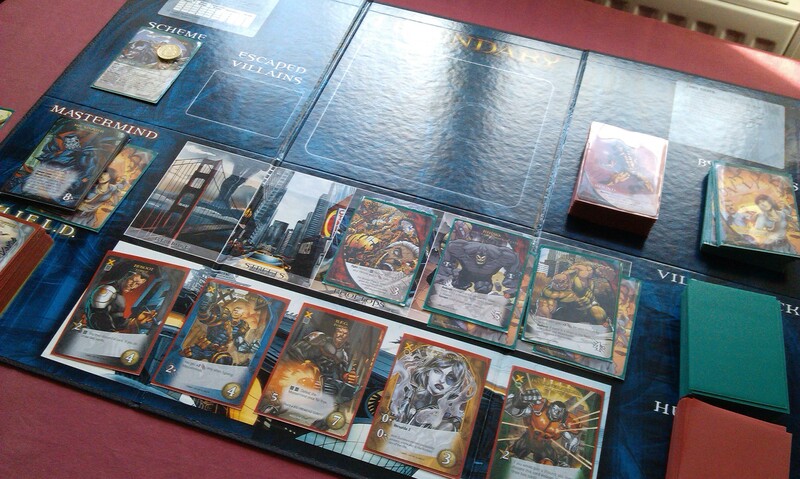 Author spalanzPosted on September 29, 2015 October 6, 2015 Categories board gamesTags card games, deck-building games, game day, Marvel, Marvel Legendary2 Comments on Dark City!